Finally, in 1982, ending a process that began in 1981, Canada cut the second last umbilical chord with Great Britain (the last being the Monarchy which affiliation with if not subordination to, continues ...), repatriated the Constitution and wheeled out an all-powerful, made-in-Canada charter of human rights and basic freedoms ... shaking every nook and cranny of Canadian law. There were birthing pains: see 1980| A Constitution Comes Home. A major addition was made to the Canadian constitutional laws: a Charter of Rights and Freedoms. Canada, circa 1981, was already with some essential human rights statutes, such as the influence on British laws of the Magna Carta in 1215. Beginning in about 1930, Canada's Supreme Court began teasing constitutional law forward by articulating fundamental legal rights. Some of these cases were very high profile such as Roncarelli v Duplessis but no less important were the 1938 case, Re Alberta Statutes and then, in 1953, Saumur v Quebec City. "Liberty ... is little less vital to man's mind and spirit than breathing is to his physical existence." Then, in 1960, with his heart in the right place, Prime Minister John Diefenbaker's government passed a Bill of Rights. Although it was limited to the federal government only, the Courts used it and showed it was prepared to use the teeth the Bill had given it. In Drybones, it struck down an offending section of a federal statute. But what really stoked the fire were developing international treaties on human rights, such as the 1948 Universal Declaration of Human Rights. The influence from the United States press reporting on the evolution of desegregation was also not lost on the Canadian people. Right in their own back yard, Canada squared up to human rights issues in struggling to fairly accommodate the French language not only in Quebec, but in other provinces with substantial French-Canadian heritage and population, such as New Brunswick, Ontario and Manitoba. But then the courts blinked and began to drawback from an assertive, common law but judicially driven approach to evolve human rights in Canada. Nonplussed, Saskatchewan broke out on its own with a provincial Human Rights Code in 1979 but again, limited to the one provincial jurisdiction. It took the personal drive of Prime Minister Pierre Trudeau, a constitutional law professor, to convene the provincial premiers and hammer out a Charter. 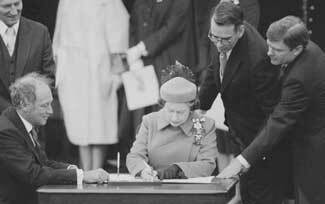 Although the formal statute would not enter the law until the ceremonial signature by the Queen of England on April 1, 1982, November 5, 1981 marks the day that all provinces and the federal government agreed on the package that included the Charter. In December of 1981, the federal Parliament approved the document and in March, 1982, the United Kingdom followed suit (the UK Parliamentary approval was technically necessary as the laws which had formed Canada in 1867 were still on England's books). On April 17, 1982, the British Queen came to Ottawa and there she signed over the Constitution, including the new Charter (pictured). In one fell swoop, words that lawyers had been using for ages were defunct. The British North America Act, taught in Canadian grade schools since 1867, became the Constitution Act, 1867. Lawyers, being lawyers, then set out a new and distinct law, the Constitution Act, 1982 which is simply the Charter itself since that is all there is to it. Thus, and unfortunately, the Charter has two formal names: the Constitution Act, 1982, which is nothing more nor less than the Charter; and the Charter itself which is called the Canadian Charter of Rights and Freedoms. The Charter of Rights and Freedoms applies to all laws of Canadian provinces and those of the federal government. Few would argue with the assertion that the Charter is the most important law in Canada. English and French are the official languages of the Governments of Canada and of New Brunswick. Beaudoin, G. and Mendes, E., Canadian Charter of Rights and Freedoms (Toronto: LexisNexis-Butterworths, 2005). Charter of Rights and Freedoms, The Constitution Act, 1982. Sharpe, R. and Swinton, K., The Charter of Rights and Freedoms (Toronto: Irwin Law, 1998).